Thailand - cheap return flights to Bangkok from €263! Cheap return flights from Brussels to many cities in USA from €198! Thailand – cheap return flights to Bangkok from €259! Planning a trip to Thailand during off-season is possible with Ukraine International Airlines. Cheap return flights to Bangkok are now available already for €259! This is for a return ticket including all taxes as well as 23kgs checked luggage. if interested look for flights departing from London, Germany. Copenhagen, Venice, Milan, Stockholm. Helsinki. Budapest, Paris, Brussels, Warsaw. Geneva, Vienna, Madrid. Barcelona, Vilnius or Riga . Flights may require longer layover in Kiev on your inbound flight. If you take this as an advantage you can visit this city at the beginning of summer season 2019..
Limited travel options are available from 25th of May to 25th of June 2019. This means you would travel to Bangkok off main tourist season. Max stay 1 month. Discount is available till 23rd of September or until the cheapest flights last..We recommend to check what is the weather like in Thailand before you book this deal. Ukraine International Airlines usually offer very short layover in Kiev. (But as mentioned above on some routes long stop on return flight). If you are looking for budget solution to Thailand this could be an interesting option to vast European travellers. Bangkok still belongs to very cheap destinations. Of couse you may also find super luxurious hotel chains. To book some afforeable accommodation in Thailand you may use Booking.com or consider following promo codes offered by Hotels.com or Agoda. 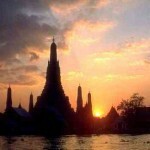 Booking sample to Thailand – cheap return flights to Bangkok from €259! In this case you would be flying from Budapest to Bangkok on Saturday, 1st of June. Your return flight from Asia back to Europe would be on 17th of June 2019. Take advantage of this amazing promotion from Europe to Thailand. Book the cheapest flights to Bangkok with Ukraine International Airlines!